Well spring is finally starting to bloom in Calgary, although we have about 2 feet of snow piled up in our back yard that still has to melt. Not sure how the gardening is gonna go this year, although I have my sights on a greenhouse this year, hope to share that with ya’ll. What to make for dinner this week? 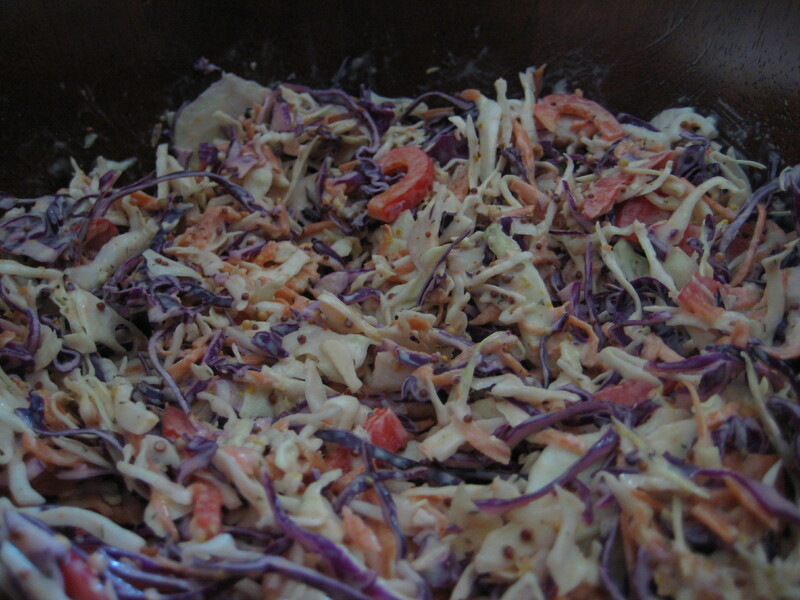 How about coleslaw. It sits well in the fridge for a day or two and is a bright and healthy addition to any meal. We love cabbage and have been buying some great red and green cabbage from the KF Market lately. I found a few recipes on-line, the best one was from Vegetarian Times, but I thought it was a bit bland so I spiced it up (do I ever follow a recipe?). I used Piri Piri sauce in this recipe. Piri Piri is a Portuguese chili. They are very flavourful and some hotter than others. I have been cooking with piri piri a long time with our family travels to Portugal. I bought whole peppers this last time and put them into some Portuguese olive oil to flavour the oil. I saw this a lot over there. 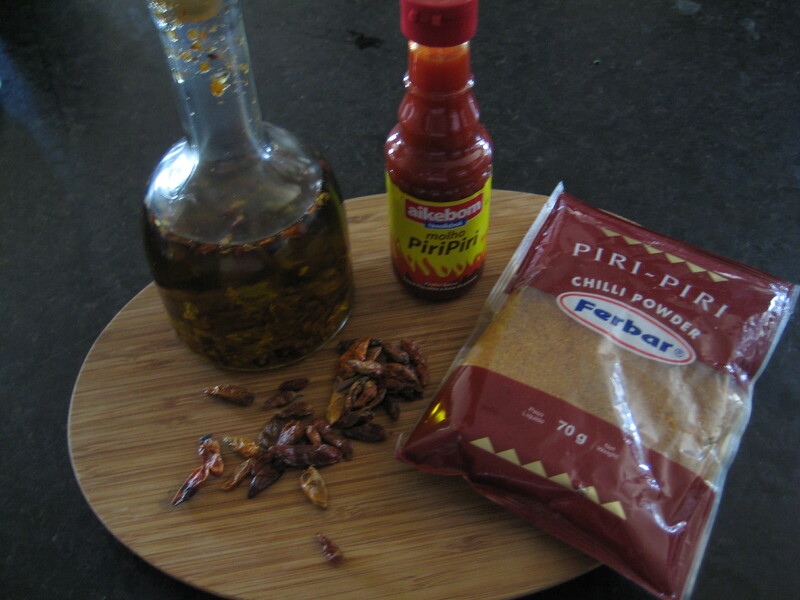 Piri Piri is becoming more popular here, I have bumped into once in a while, if you see it, try it out. If you don’t, use Tabasco or Franks Hot or any other tangy chili sauce you like. You could use fresh grated horseradish in this recipe instead of the piri piri, would be delicious. That’s an idea from my bro, who was over for dinner last night. 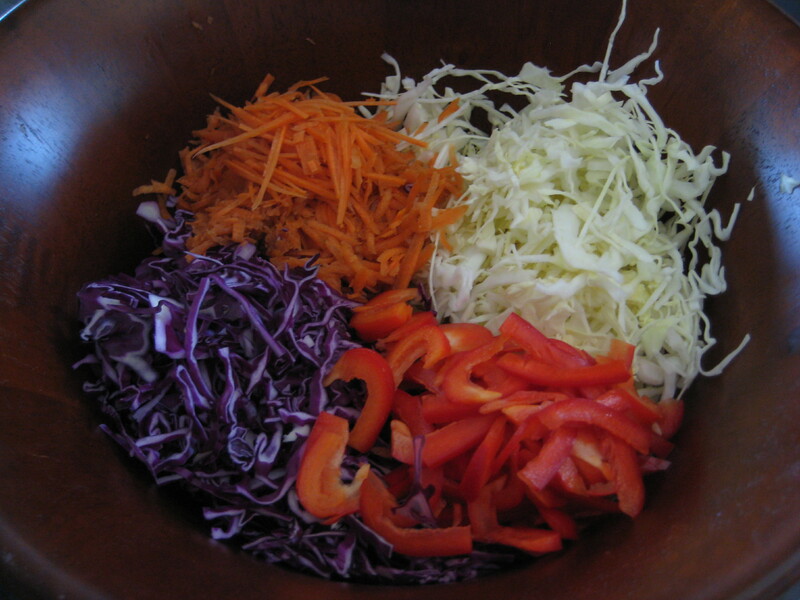 Shred the cabbage and carrots using a food processor if you have it, so easy. If not a mandoline works. Whisk the dressing ingredients together. Add to the salad and mix well. Chill in the fridge at least an hour before serving (or not, and dig in). The chilling will allow the flavours to set, and a bit of the cabbage to soften a little as it releases water, adding to the dressing. Enjoy! I hope you enjoyed the long weekend…did you know it was Earth Day on April 22? Might have been overshadowed by all those Easter Bunnies running around (remember last year, click here).